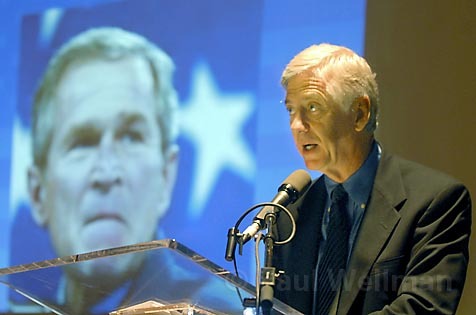 Rocky Anderson says if Bush is not impeached, we're complicit in his crimes. Anderson accused the Bush-Cheney White House of ignoring repeated warnings of a terrorist attack just prior to 9/11, and then using the emotional fallout from that attack to stampede the American public-and its elected leaders-into war. “Iraq never posed any threat to us,” Anderson said more than once. “We attacked a nation that posed no threat to our security. That’s a crime against peace, the same crime for which people were convicted in Nuremburg,” he said. Anderson concludes his second term this January and won’t be running again. Instead, he hopes to bang the gong in favor of impeachment. He accused House Democrats who oppose impeachment-including House Speaker Nancy Pelosi-of “timidity and cowardice.” In dismissing impeachment, Pelosi has argued that the Democrats must run on a record of genuine accomplishment rather than grandstanding. But Anderson noted that Congress-led currently by a Democratic majority-has accomplished little of substance. He said many Democrats-like presidential candidate Hillary Clinton-refrain from impeachment talk for fear it would highlight their votes authorizing the war. In a private conversation, Anderson remarked how Clinton had voted in favor of the war without reading available intelligence reports. Clinton has acknowledged as much, but insists she’d been fully briefed.